We’ve taken some time to write an article detailing the largest silver mines in the world. These behemoths make up 35%+ of the silver mined in the entire world. If you are looking to invest in silver mines you might want to start researching one of these. Queensland, Australia – Produced some 5% of the world’s mining supply with ~39 million ounces in 2012. Also the world’s largest lead mine. Peru, Bolivia, Mexico, Argentina – Although based in Canada, Pan American’s silver mine in Alamo Dorado, Mexico is it’s largest producing mine, delivering some 5.5 million ounces/year. Russia, Kazakhstan – With 36 licenses to mine silver in Russia and Kazakhstan, Polymetal produced some 15 million ounces of silver last year. They also have over 297 ounces of silver in reserves. Poland – Primarily known as a copper mining company, KGHM produced some 41 million ounces of silver in 2012. Some argue this makes it the world’s largest producer of silver, but some argue it depends on how their tonnage is reported as the silver is mixed with copper, then refined. Mexico – Formerly a part of the state owned mining operations, Fresnillo produced around 39 million ounces of gold last year from the three mines they operate in Mexico. This output may slide due to declining ore grades. With mines located in Bolivia, Mexico, Australia and the US, Coeure d’Alene is one of the few silver companies with operations in the US. Between their Palmarejo, Mexico mine and the Rochester mine in Nevada and their Bolivian mine, they produced some 18 million ounces of silver in 2012. 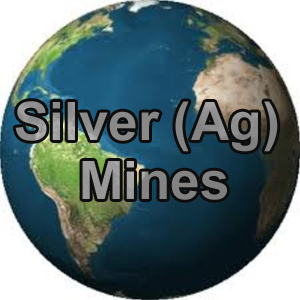 As you may notice, silver mining is a worldwide process. Since most mining companies mine far more than silver (gold, lead, copper and zinc are just a few examples), if you have plans to invest in a mining company, you’ll want to do more research into the other metals produced. Also, keep in mind that, depending on where the mine is located, the quality of the ore being mined and the economy surrounding the process, some mines achieve a much lower cost per ounce than others. as an example, the Alamo Doredo mine owned by Pan American has a cost per silver ounce of around $5USD while the operating costs of Coeur d’Alene’s Palmareo, Mexico mine is around $1.35USD per ounce. There are differences that truly can make a real difference in your investment strategy, and a “top” list only gives you so much information.